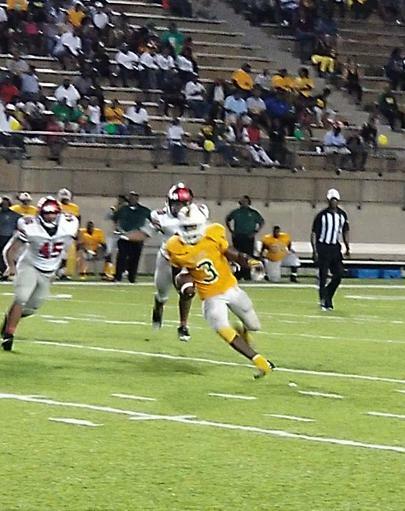 RB #3 Terrance Webster (Carver-Montgomery) with a run vs Dothan Thursday night. MONTGOMERY, Alabama -- The Carver Wolverines turned two defensive touchdowns in the second half and go on to defeat Dothan 43-7 on homecoming night at the Crampton Bowl Thursday night. Ke'Shun Brown had a 15-yard pick six and Carl Hopkins followed with a 96-yard interception touchdown return while the Wolverines defense shut down Dothan for most of the game. Carver (5-0, 2-0) scored two touchdowns in the last minute of the second quarter before halftime and crussed the rest of the way in the second half. "This was a good win for our football team," said Wolverines head coach James Thompson. "Our guys started fast but we had a couple hiccups in the second half, but impressed the way we played tonight. Our defense has played well the last four weeks playing hard and playing fast. The coaches on that side of the ball have done a great job with our defense." Carver scored first in the game when Kole Williams scored on a 1-yard touchdown run with 9:17 left in the first quarter. On the next possession, Dothan was pinned back in their own territory and on a fourth down punt attempt, Dothan snapped the ball out of the end zone for a safety and Carver led 9-0 with 4:20 left in the first quarter. With 1:42 left in the first quarter, Elsylvesticondre' Provo scored on a 4-yard touchdown run to give the Wolverines a 16-0 lead late in the first quarter. With 3:38 left to go in the second quarter, Antarrio Howard scored on a 10-yard touchdown run and Carver led 23-0 late in the first half. Dothan (2-3, 1-2) scored on a Kam Dawsey to Deshawn Owens 34-yard touchdown pass play and the Tigers cut the Carver lead to 23-7 with only :51 seconds left in the half, but Carver responded with :15 seconds left in the half, when Williams hit Donald Steele on a 37-yard touchdown pass play to give Carver a 30-7 halftime lead. In the second half, the only scores where the two pick sixes with Brown and Hopkins for the Wolverines. "We were talking right before the game and right before the play, they need to throw to my side," said Wolverines DB Hopkins. "I saw the ball come my way and didn't want to drop it. I had to make a cut to keep going on the return but I didn't know I was going to score until my Cortavious Smith made the key block to get me into the end zone. If it wasn't for him, I wouldn't have scored but he made a great block." On offense, Terrance Webster was the workhorse for the Wolverines offense. "My O-line was block very well, my coach told me to run behind my line and follow them that I was going to get opportunities," said Wolverines RB Webster. "I have to give credit to my line, they did a great job of opening holes for me to go in. When I get the ball, I want to get to the end zone, but I know sometimes I have to be patient and wait for my blockers to open up the whole." 2018 Alabama6aFootball.com All rights reserved.